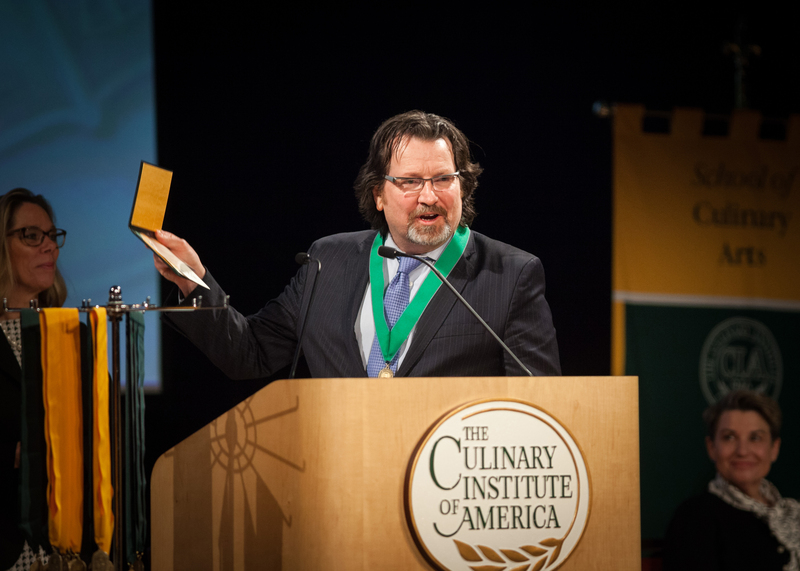 Hyde Park, NY – Terrance Brennan, executive chef at The Roundhouse in Beacon, NY, was the keynote speaker at commencement exercises at the New York campus of The Culinary Institute of America on January 20. The Roundhouse by Terrance Brennan is a new boutique restaurant that opened in October 2016 featuring whole-farm and nose-to-tail cuisine, and showcasing the agricultural richness of the Hudson Valley. Chef Brennan is also the CEO of the food, beverage, and management companies Brennan Group Consultants and Brennan Group Hospitality. Before his recent move to the Hudson Valley, he spent 22 years as executive chef and owner of the acclaimed Picholine in New York City. For four years, Picholine held two stars in the Michelin Guide. Earlier in Brennan’s career, Food & Wine magazine named him among America’s Best New Chefs for 1995. Last year, Chef Brennan and CIA President Dr. Tim Ryan co-hosted Chefs for Clearwater at the college to raise awareness of issues involving sustainability, food ethics, and the Hudson River watershed.